It was in Hawaii that I got my first exhilarating taste of passion fruit. The Maui market vendor's knife expertly sliced through the mauve skin at the top of the egg-sized fruit, revealing bright orange innards that reminded me of salmon roe. He quickly carved the sliced-off cap of the fruit into a scoop, and dipped it into the glistening orange mass to offer me a taste. The first thing I noticed was the intoxicating tropical floral aroma. Then, at the first contact with my tongue, came the explosion of bright clean citrus with just enough sweetness to cut the sour. In the tangy gelatinous goo were many small crunchy seeds, which provided a nice textural contrast. One slurpy bite led to another until the mauve skin was an empty eggshell. But I craved more, and so bought a whole bag of passion fruit, known as liliquoi in Hawaii, and snacked on them the rest of the day. Later I learned that the passion fruit (Passiflora edulis) is native to South America, probably originating in the southern region of present-day Brazil. It was there, in the 16th century, that Spanish Catholics named it Flor de las cinco llagas, flower of the five wounds. Other missionaries expanded on this, and saw in the beautiful flower's parts a way to teach indigenous people about the torture (passion) of Christ. The five anthers at the tip of the male parts represented the five wounds of Christ, the vine's tendrils were the whips, the three female stigmas the three nails in Jesus' hands and feet, and the 10 petals and sepals were the apostles, excluding Judas (for obvious reasons) and Peter (for not so obvious ones). Although the missionaries saw violence and suffering in the passion flower, its huge and elaborate blossoms have more pleasure than pain in their voluptuous beauty. The showy corolla highlights the architecture at the center, where the prominent female parts (stigmas and styles) float over the top of the male stamens. And the fruit that develops from this gorgeous flower is full of goodness -- high in vitamins A and C, potassium, dietary fiber and iron. For all its goodness, however, like so many plants and animals introduced into the delicate Hawaiian ecosystems, the passion fruit had invaded all of the Hawaiian islands a mere 50 years after it was introduced in 1880. Due to a plant virus, and high labor costs, the few passion fruit farms disappeared shortly after they were planted. Although there are no commercial passion fruit plantations in Hawaii today, the vines can still be found in people's yards and in wild areas, and the fruits are used extensively in foods and drinks. During my Hawaii sojourn, I had the pleasure of drinking fresh liliquoi juice, and also indulged in passion fruit cheesecake, jelly, smoothies and margaritas. While passion fruit grows well in California, Florida and other southern states, it generally can't take the cold winters of the temperate zones. The one exception is the Maypop (Passiflora incarnata), which is native to North America, and is the state wildflower of Tennessee. The most cold-hardy of the passion fruit family, it grows well in zones 7-11, and even as far north as zones 5-6, if you mulch it heavily before winter. The name Maypop might have come about because the plant pops out of the ground in May and dies back in winter, ready to pop out again in May. Others say the name comes from "maracock," which was the Powhatan Indians' name for this plant. If you live in the southern U.S., especially California or Florida, you will most likely be able to find passion fruit at your local farmers market. You also have a good chance of finding them in the produce section of ethnic grocery stores. If you strike out, you can find frozen passion fruit pulp in many grocery stores, or order it online. Or you can grow your own. The vigorous, vining plant is often used as an ornamental screen, or can provide shade cover on a pergola. With its showy flowers and delicious fruit, what's not to be passionate about? 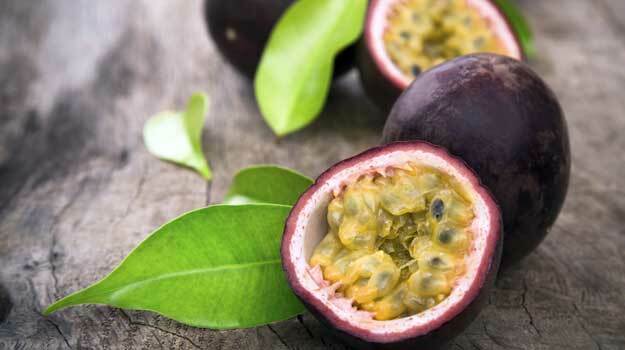 The bright, strong taste of passion fruit makes it a great addition to any smoothie. 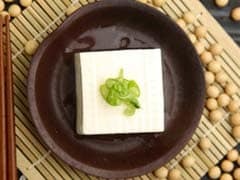 It's especially good with creamy, custardy fruits such as mango, banana or cherimoya. Of course, you can use whatever fruits or greens you have on hand, but here's a starter recipe. Cut the passion fruits in half and scoop all of the innards into the blender. Add all the other ingredients and blend. Because passion fruit has a lot of seeds, use a powerful blender at its highest speed to get a smooth smoothie. Macaron Versus Macaroon: What's the Difference?